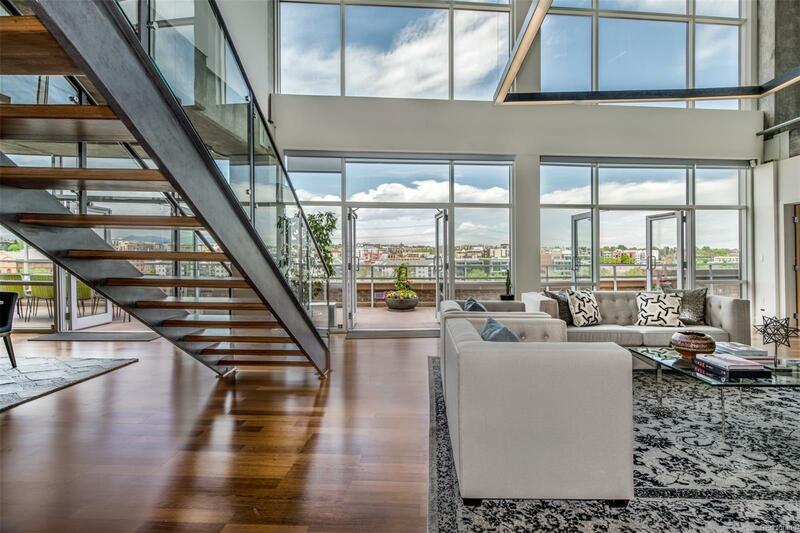 One of a kind opportunity to own this incredible penthouse! This two story residence boasts 21 foot ceilings in the living area and an 80 foot span of windows and doors that open to a coveted, west facing terrace with forever park & mountain views! This rare terrace creates an extension of the living space and is perfect for indoor/outdoor entertaining and living. A cooks kitchen with Viking and Sub Zero appliances and a large walk-in pantry, informal and formal dining rooms and living room with double sided fireplace and custom lighting throughout. Main floor master retreat with French doors to the terrace and a spa like 5-piece bath with jetted tub, steam shower, and city facing balcony. Architecturally stunning wood and metal floating staircase to the second floor that has 3 en-suite bedrooms and a bonus room which is perfect for a game room, work out room or home office. Located in on the plaza in the heart of Riverfront Park with Union Station & the train to DIA at your back door!